This is an outstandingly well run hostel in a wonderful location. The management of the woodland adjacent is a further asset and encourages wildlife and flora. When would you like to stay at YHA Boggle Hole? Ahoy there! If you're looking for UK beach breaks, activity breaks or just accommodation near Whitby and Robin Hood's Bay, YHA Boggle Hole could be just the place for you. Tucked away in an old smuggler’s cove, our lovely Old Mill will delight and inspire you, with its treasure trails, stunning sea views and wooded grounds for the kids to explore. Once safely indoors, treat yourself in our well-stocked Quarterdeck café, and enjoy the warmth of the woodburning stove when the weather is cooler. Our main hostel building is full of character, charm and a fascinating history! 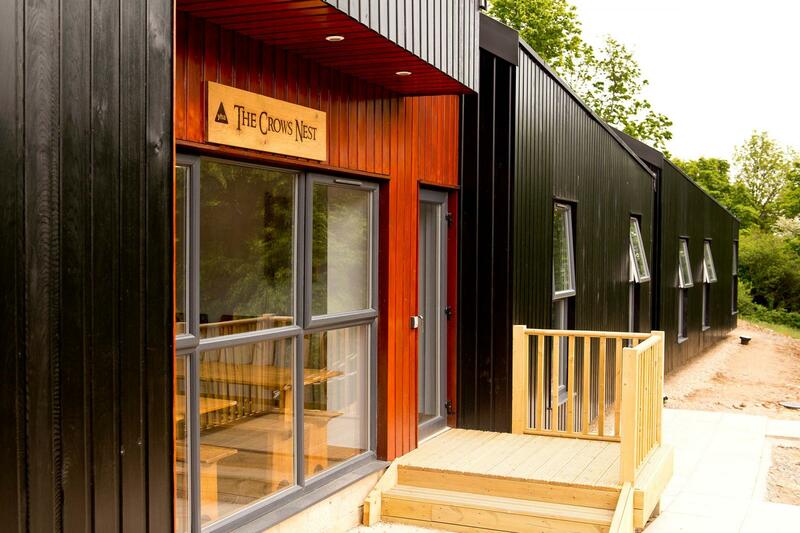 The mill comprises 42 beds shared between rooms of all sizes, with all the usual Youth Hostel facilities plus a sandpit, mermaid, old boat and pirates. There are also picnic areas, lovely peaceful spots to read, a courtyard where you can eat on sunny days (it rarely rains) and a beach on the doorstep (and we mean on the doorstep). Stay in our brand new Crow's Nest - an environmentally friendly timber frame building looking down into the valley. Use our versatile new Boat Shed space for meetings or activities, perfect for locals or group trips. Relax with our new The Brigg overflow dining room's stunning sea views - fab for sipping those sundowners on! 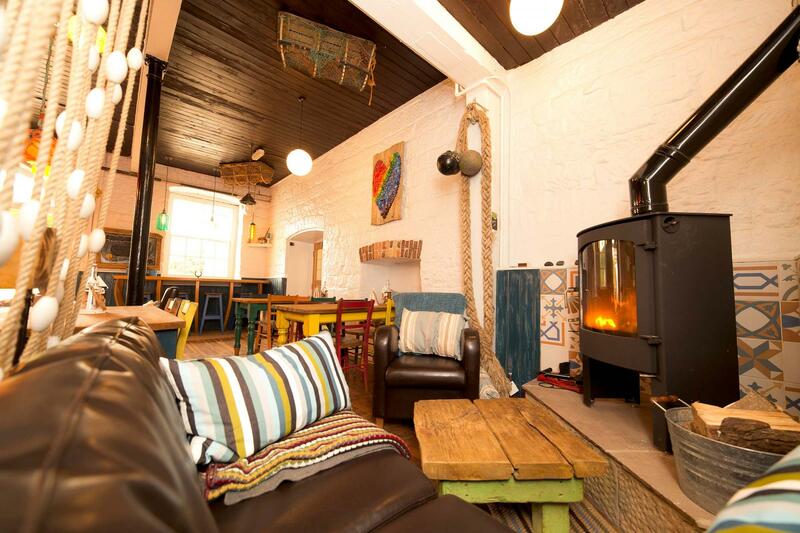 Enjoy an improved main hostel with pirate-themed decor, a cosy woodburning stove and great catering facilities. Have a coffee or an ice cream in our fun Quarterdeck cafe - now open for business to guests and the public. Built in 2015, this environmentally friendly building comprises 44 beds, with a mixture of family rooms, en-suite rooms and traditional dorm beds, boasting fantastic valley views. There is a kitchenette area with some bench seating and long tables. Please note: all en-suite rooms at YHA Boggle Hole are in The Crow's Nest up a large flight of steep steps. It is recommended that families supervise young children on the steps. Our Quarterdeck Cafe & Bar provides the opportunity to relax and dine just a stone’s throw from the beach. Offering a broad selection of delicious food throughout the day, alongside a range of freshly made hot drinks and a well-stocked bar. Open daily to guests and passers-by, let us welcome you to take a break from the rock pools and bracing sea air in front of our blazing wood burning stove. Choose from our tasty daily specials or delve into our café-bar style menu experience, think scrumptious bar snacks, light bites, grilled paninis and loaded stone-baked pizzas. Kids under 10 eat free – get one kid’s meal free with every adult’s meal. Parking: Parking is 500m away and a brisk walk down to the sea and the hostel. Because there are no street lights, you'll need a torch after dark. Pets: Pets are not permitted at YHA Boggle Hole. Assistance dogs are welcome. YHA Boggle Hole is close to the Yorkshire Heritage Coast, providing plenty of opportunities for students to have dozens of enjoyable learning experiences! The hostel accommodates 85 people, has internet access, fantastic classroom facilities and group catering is available. Visit the YHA School Trips website to book your field trip. It is believed that the Farsyde family built Bay Mill, the main Youth Hostel building, to serve the estate's own farms. The first mention of two mills in the parish appears in the marriage settlement of Sir Hugh Cholmley in 1666, where low mill is almost certainly Bay Mill. The other mill is believed to be Ramsdale Mill which has been restored. In 1712 a lease refers to ‘Bay Mill or ‘Low Mill’. The mill would have originally been a wooden structure and much smaller than at present, with the wheel run directly by the beck. Certainly a later Farsyde rebuilt the mill into something like its present form. An inscription (which is now seriously weathered) over the dining room door reads “This Mill was rebuilt and new machinery put therein at the cost of G. W. Farsyde Esq. AD 1839”. On August 6th 1857, a tremendous rainstorm caused violent floods which destroyed some buildings at both Ramsdale and Bay Mills. Mr Farsyde’s substantial building of 1839 survived but the miller's house, believed to be situated on the other side of the stream, and some wooden outbuildings were destroyed and washed away. The housekeeper, Elizabeth Knaggs, and a dog were both drowned. At the time, the miller had two apprentices named Hutton. The son of one of them, Halder Hutton told a story related by his father of how the two brothers rescued a baby from the miller’s house just before it was destroyed. It was probably after this that the miller’s house was re-sited at right angles to the main building. It comprised what is now the main hostel kitchen and the rooms above. The land surrounding the mill on both sides of the beck were farmed, mostly for grazing of cattle and sheep. There was also an orchard and garden for fruit and vegetables alongside the path which leads to Farsyde House. Farm buildings surrounded the courtyard and these have since long vanished apart from one which has been substantially rebuilt to form the current staff bungalow. There is no record of when the dam was built but it was constructed on the site of a natural waterfall. It held back a considerable body of water. The lake has long since silted up. In the late 19th and early 20th centuries, gangs of men were employed from time to time in the dry season to dig out the silt and ensure a constant supply of water for the mill. Water ran from the dam in an underground passage to the present self-catering kitchen. It entered the building where the present window and extractor are, powering the wheel which filled this room and the cellar below. The water than ran out into the beck. The main drive shaft extended into what is now the dining room and drove four pairs of stones set into the floor of what is now the toilet and showers on the reception level. Near the top of the dam, in the bank side there is still a dry shaft. This was the entry to the sluice gate which allowed the water to be let into the underground passage and power the mill. A secondary gate with a diversion into the back has also been found under what is now the picnic area behind the hostel. On top of the dam is a large cast iron wheel which allowed the dam gates to be opened. The missing one is actually in the pool behind the dam and is visible at very low water. The custodians of Boggle Mill, Peta and Andy, have worked here for about 20 years (this means they must have started when they were 10!). They make lots of the furniture and decorations and are more than happy to chat about them. They have lived in the area for ages and can recommend lots of things to do and places to see (although playing on the beach is the best)! Our lovely crew will look after you if you need anything many have been here for a long time as well so know the area and its charms and best secret spots as well. Manager recommends: For a real family beach break, spend your free time playing and walking along the beach to Robin Hood's Bay, searching for fossils and Whitby Jet, swimming in the sea and beachcombing for ‘washed up treasures'. Take a packed lunch and spend the whole day away from the hustle and bustle of the real world - and enjoy the delights of a UK coastal holiday!